I have been churning out short stories lately and my favorite editor asked me why I was doing short stories rather than working on a novel. I told her that sometimes it pays to focus on short stories. 1. They are short and not as much of an investment. I read an article the other day that said writing a novel is like lifting a 500-pound barbell. Novels require a lot of work, both in preparation and writing time. Authors rarely finish more than one novel a year and some, like Donna Tartt, need a decade per novel. The best thing about short stories is they don’t take long to write. They are more like lifting a five-pound barbell. Most people can write 500 -2500 words in a day, which is the average length of a short story. I have been writing for contests where the limits are 3500 -5000 words. If your muse is cooperating, you can finish a first draft in two to four days. Even if a short story pushes the absolute maximum word limit of 25,000 – 30,000 words, it can be completed in a couple of weeks. It feels great to finish a writing project in a compact period of time. Because a short story isn’t much of an investment, it is also relatively painless to discard it if it doesn’t go as planned. If it doesn’t gel, simply move on to the next project. In addition, if you’re stuck in a dry spell, one good idea is to do some reading, but another is to work on a short story. Sometimes the small success of finishing a short story can help jump start a larger project. 2. Short stories give you the freedom to stretch your writing muscles. Writing short stories allows you to try out different styles and genres. I’ve recently written humorous essays, a science fiction/police procedural, and dabbled with metafiction. The latest short story I’m working on is xenofiction, which is told from a non-human point of view. Back to my editor’s questions. She also asked if practicing the short story techniques and formatting — which are not the same as novel techniques — might interfere with my ability/desire to write a novel. I said no. In fact, writing short stories allows you to play with voice, plot, characters, etc. in ways you wouldn’t want to do with a novel. If your short story not working from a limited third person point of view, it is easy to switch it to first person and compare the results. When the protagonist narrating the story makes the pace drag, try having the antagonist narrate. If the past tense sounds clunky, try present tense. Mix it up with a perky voice or a snarky one. In a short story you can be brave and have fun being creative. If you have an idea for a novel, you might want to go ahead and try it out as a short story. Think of it as an extended synopsis. You may be able to detect problems and fix them early on, or even decide it isn’t worth developing. A writing mentor recently suggested the reverse, to turn a short story into a novel because “novels make more money.” I’m not sure that was good advice, because some ideas are not big enough to carry a full novel. A story line that works for a thirty-second ad is probably not enough for a 10-episode television series. For another take on this, see How to Make a Short Story into a Long One. 3. Once finished, short stories don’t require as much attention. One big advantage of short stories is that you don’t have to promote them (unless you publish a collection). You don’t need an agent and you don’t have to do a book tour. You submit to a magazine or a contest, and it’s thumbs up or nothing. If you lose or are rejected, you can polish some more and submit the same piece elsewhere (as long as the contest didn’t take your rights — read the fine print!) No need to devote months of your life to marketing. That said, you also might not get as big of a reward. Some contests are costly, and more and more magazines require a reading fee just to submit an article. It is possible with a little research, however, to find reputable contests and magazines that don’t charge fees. An added benefit of writing for contests is that there’s a fixed deadline for submission. Deadlines are great for motivation. Some authors have had success publishing their short stories directly to eReaders like Kindle, too. 4. Short stories can help build an author’s platform. You can attract fans to your website, plus build up an email list by offering short stories. It works best if you stick to topics/genres related to your novel(s). Many savvy authors use short research and backstory pieces to entice fans. Include a few personal essays, which would also appeal to fans who want to find out more about you as an author. 5. Publishing short stories can give you recognition and credentials. If you do finish your novel, it might be easier to get an agent if you have some published work and particularly, if you’ve won awards. Short stories might give you some much-needed credentials. Not every writer enjoys writing short stories. 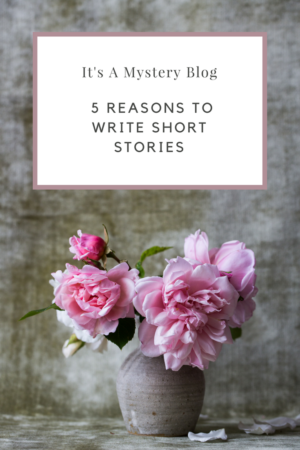 For example, some of the famous authors in the short story compilation MatchUp said they were “short story challenged.” Given all the reasons above, however, the ability to write short stories can be a handy skill to have. Thanks to Karen for the idea for this blog post. Great advice for the amateur writer. Funny this is exactly what I am working on right now! I have been working on a novel for eons, I swear lol but I’m having trouble getting across some of the backstory. Writing a short story about the backstory has helped sooooo much. I know what details need to be included and which are unimportant and the plot and ending are so much clearer in my mind. Thanks Jo-Ann. Amazing things can come out of those backstory shorts. I enjoy writing shorter pieces for a lot of the reasons you brought up-especially the faster feeling of accomplishment! (Also, less editing. Definitely enjoy the faster read throughs. *is very lazy*). Ah, I didn’t think about reduced time spent editing, too. Good point.